Not to be confused with P.L. Travers. Peter Travers is an American film critic and journalist, who has written for, in turn, People and Rolling Stone. Travers also hosts a celebrity interview show called Popcorn on ABC News Now and ABCNews.com. Travers joined Rolling Stone in 1989 after a four-year stint with People. According to eFilmCritic.com, Travers is the nation's most blurbed film critic. Some of the contemporary directors he is most receptive to based on ratings and placement in top ten lists include Martin Scorsese, David Lynch, Paul Thomas Anderson, Clint Eastwood, Christopher Nolan, Joel and Ethan Coen, and Ang Lee. He has also shown a great deal of disdain for certain directors, most notably Michael Bay and his films. Travers also hosts The New York Film Critics Series® (NYFCS®), one of the leading word-of-mouth screening companies, partnered with the nation’s leading independent cinemas to present live, national, in-theater screenings with captured live stars, directors and producers. Since 1989, Travers had reviewed for Rolling Stone 2,465 movies as of July 21, 2011. On April 10, 2002, Travers began using intensively a star-rating system ranging from No star to Four Star. He used such system very seldom before, and not all reviews are rated. 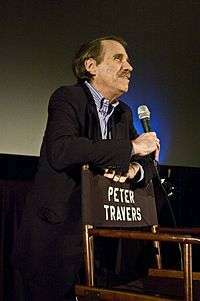 ↑ "New York Film Critics Circle: Peter Travers". New York Film Critics Circle. Archived from the original on 27 April 2006. Retrieved 3 April 2010. ↑ Childress, Erik. "Criticwatch 2008 - The Whores of the Year". eFilmCritic.com. Retrieved 3 April 2010. ↑ Childress, Erik. "Criticwatch 2009 - The Whores of the Year". eFilmCritic.com. Retrieved 3 April 2010. ↑ "NY Film Critics Series". Nyfilmcriticsseries.com. ↑ "Rolling Stone Movies - Movie Reviews". Retrieved 2011-03-27. ↑ "Movie Reviews : Rolling Stone". Rolling Stone. Retrieved 24 January 2016.